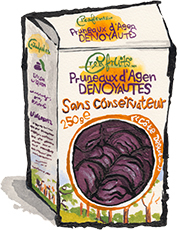 Prunes d'Agen for sale. Buy online at Zingerman's Mail Order. Gourmet Gifts. Food Gifts. The famous dried plums of Southern France. Prunes. It’s one of those words you should never use to market a food. Almost all its connotations are bad. So let me start by calling these dried plums. Now, doesn’t that sound better? Dried plums from Agen, a town in southwest France just below Bordeaux, are kind of like hazelnuts from the Piedmont or sour cherries from Michigan. They’re a famed food, an agricultural event people travel great distances just to taste. Now you can save yourself the trip. Though dried, these plums are incredibly moist, almost juicy, when you eat them, with a dark caramel note in the flavor. You can enjoy them as is, any time. I like to add them to yogurt for breakfast. Or do as they do in Agen: soak them in Armagnac brandy, and enjoy them after dinner with some cheese.